Initially when I bought fabric to make a Tardis pillow, I thought the starry background was a good idea. 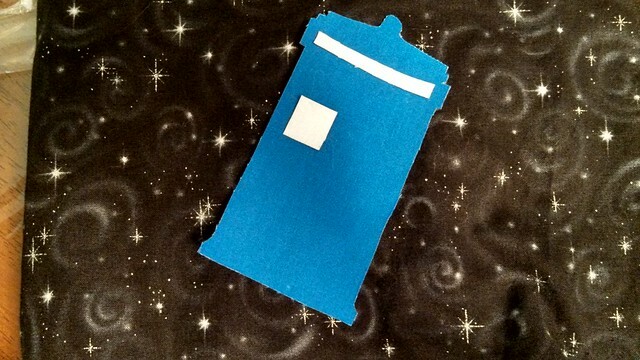 When I cut out the Tardis and laid everything out to show Chris, he correctly pointed out that the solid Tardis against the screen-printed background looks kinda terrible. He then laid out everything on the computer to illustrate a few different looks that didn't clash so much. He's a lot better at putting projects together visually than I am, so I try to bounce ideas off of him when I can. After all, that's what he does for a living. Once we decided on one, we headed out to Joanne Fabrics and picked up a more basic and non-print fabric. 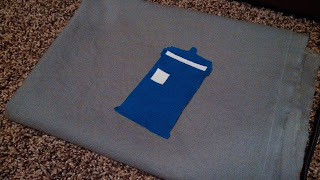 We also picked up some fabric for the Dalek I'm going to put on the pillow as well. So I'm one step closer to making a pillow that will be cute or a disaster, depending on my sewing skills.